I have decided I don't want to offer my print for swapping, how do I remove it from the feed? Find out how to take your print out of Print Club and what happens afterwards. 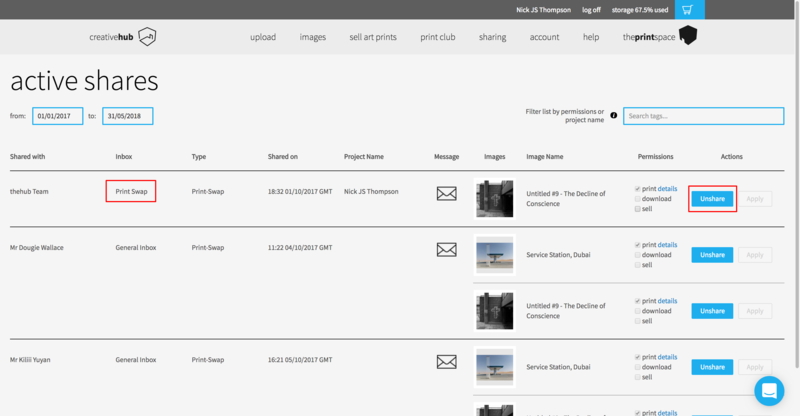 If you have decided you don't want to offer your print as a swap anymore, you can remove it by navigating to ‘Sharing’ in the menu bar on thehub, then click ‘Active shares’ on the dropdown menu. Once you have found it, click unshare and this will remove it from the print swap feed. If you have agreed swaps, the other party will still be able to make their print. When you remove an image from creativehub, other artists will not be able to make any new requests for swaps. Any swaps you have already agreed before removing your image will still stand, and after the other artist has successfully printed your image this will be removed from their hub account.